Happy Father's Day to each of you! We are so blessed to have you in our lives! Love to you all! I realized today that we have had our blog now for four years (and three days). As I look back over the last four years, I am amazed at how much we have accomplished, all of the adventures we have had, all of the ups and downs. We both quit our jobs at the other travel agency (at about five months pregnant!) and started our own Disney-focused travel agency. Our company has grown more than we ever could have imagined, but more importantly, we are happier than we ever were at the other agency. We love having the freedom to "skip" work for the day to go to the zoo with Hannah. We have an amazing group of agents that are as Disney-crazy as we are (if not more!). Chet resigned from his worship minister position at the church in Irving to pursue his speaking ministry full time. Even more doors opened up when a travel client contact heard what Chet was doing and was working for a Speaker's Bureau at the time. Now, Kyle works as Chet's manager and we are so blessed to have him and his family in our lives. (We just wished we lived closer to them!) God continues to bless us in this ministry providing more opportunities for Chet (and his Dad) to speak to all different types of events. They (and sometimes Hannah and I join them) travel across the country to speak to pro-life ministries, corporate events, churches, universities, and even a few government offices. We are so blessed by these events and uplifted by meeting people with their own stories to tell. Our sweet little girl was born in March 2008 and is now a happy little three year old. She blesses our lives more and more each day. She makes us laugh with her sweet sense of humor, loves to dance and sing, do crafts with Mom, and play house with her babies. She plays computer games with Daddy, loves going to school and to bible class, and loves to read. She loves to play outside (as long as there are no bugs! ), swim, and spend time with her grandparents, aunts, uncles, and cousins. We thank God for her every day! We have traveled to Walt Disney World, Disneyland, and have been on more Disney cruises than I keep up with. We have visited Baltimore, Hershey, Pennsylvania, Washington D.C, Denver, Nebraska, Nashville, Kansas City and Wichita, St. Louis, and many others that I can't think of right now. With speaking and traveling for the travel business and vacation, there is a rarely a time that we are home for the entire month. But I wouldn't trade our life for anything. We have created amazing memories and feel that Hannah (and us, too!) learn so much by being out in the world and experiencing it rather than reading it from a book. We love meeting new people, talking with them, and are blessed by their stories. This one is a hard one to write as not many know this. We have struggled with fertility these last four (plus) years. After struggling for over a year, we decided to look into adoption. Just a few short few weeks later, we got an incredible surprise. We have been trying for a little brother or sister for almost two years now. 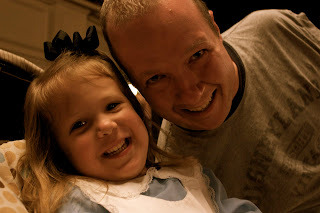 On Hannah's third birthday, we found out that she was going to be a big sister. One month later, we discovered that the baby had stopped growing and I was trying to miscarry. The loss of our little one is still a daily struggle for me only made easier by my sweet husband, precious daughter, and relying on God. Please pray for us as we continue on this difficult road. Thanks so much to all of you "involved" in our lives by reading our blog! We are blessed by each one of you. 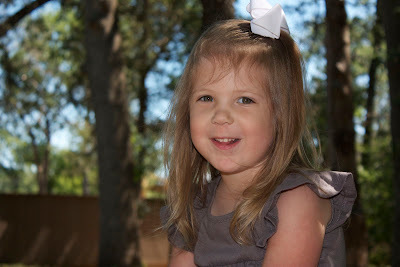 Here is a picture of my sweet girl at the Grapevine Botanical Gardens. We headed out there a few weeks ago on that one random day that was only 80 degrees! Perfect day for walking around, feeding the fish, and playing on the playground.